We use glue for a wide range of professional, household, and DIY applications these days, with adhesives playing an important role in almost any manufacturing task there is. A lot of people also use glue for modeling and plastic-related projects, yet not all adhesives can be expected to bond well with plastic. As a matter of fact, you might want to consider special epoxy glues if you work with plastic on account of their superior bonding with any plastic-based materials. With that in mind, let’s take a look at the ten best epoxies for plastic the market has to offer. Containing 30 ml of premium quality bonding liquid, the Ceramic Glue – 2 Part Epoxy Plastic Adhesive is designed with the unique ability to fix and seal flexible and rigid surfaces permanently. This kit comes in two parts which include 2 easy screw-on tops and are much stronger than other glues of its kind. After application, it stays in a liquid consistency for up to 2 minutes before turning into a gel-like substance, but gets harder and starts curing in 24 hours. Resistant to shocks and extremely flexible, this adhesive will repair and seal all kinds of plastic, metal, ceramics, leather fabrics, canvas and more. It also works great while fixing car parts, leaking pipes, worn out shoe soles, ornaments, belts, and more. 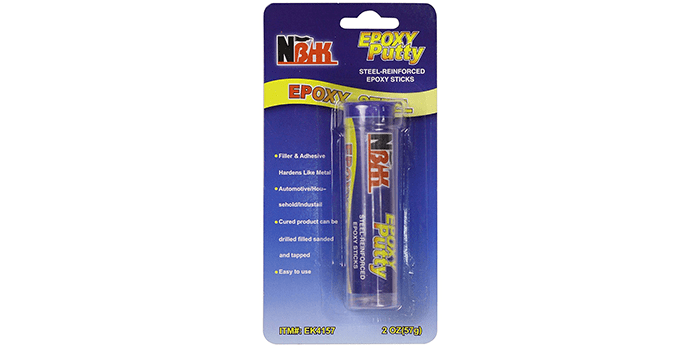 Designed to repair and seal tanks, drains, and pipes, the Yanyi Epoxy Putty Stick is a heavy duty epoxy glue that can be used to repair furniture, pools, toys, appliances, and automobile parts. Ideal for bonding all kinds of material, this putty glue can fix all types of plastic, stone, wood, fiberglass, marble and more. Easy to utilize and apply, simply cut and knead the substance until it turns a single color and applies to the area that needs repairing. With just 10 minutes to prepare and 60 minutes to cure and harden, this epoxy putty stick from Yanyi produces 100% results within 12 hours. 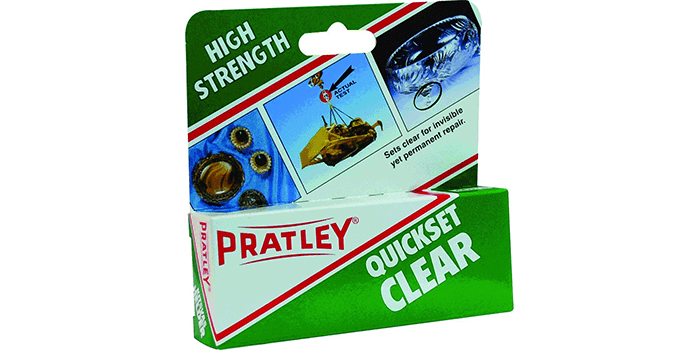 Pratley Epoxy Glue is a premium quality strong invisible adhesive that is designed to bond and repair most heavy duty rigid materials in less time as compared to other glues. 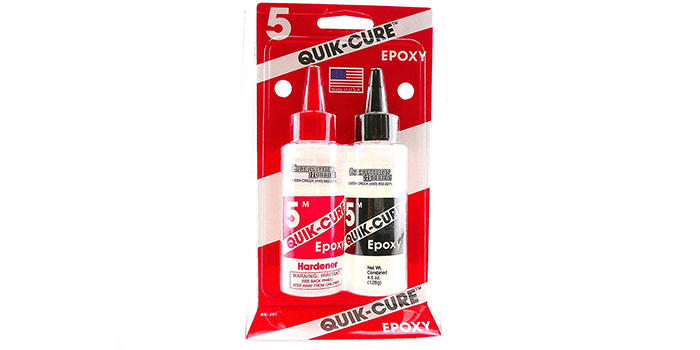 This epoxy glue kit comes with 40 ml of glue which is far more than other kits which only include 25 ml. With the ability to fix and seal plastic, concrete, metal, glass, ceramic, slate, aluminum, cement, and other such materials in just 15 minutes, it also works great on jewelry, china, and expensive porcelain objects. For best results, always ensure the surface area is clear of oil, dirt, grease, and dust. For quicker and stronger adhesion, it is recommended that you sandpaper the surface before application. 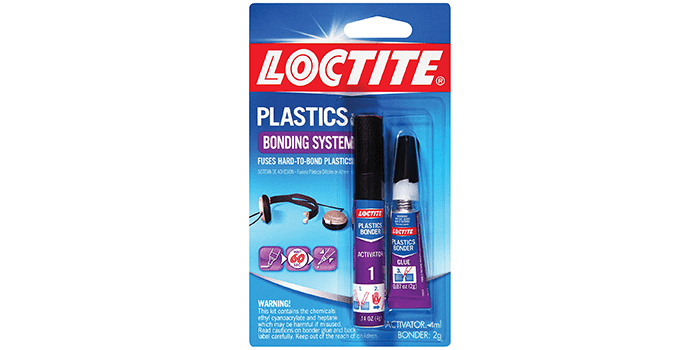 Guaranteed to seal and repair any plastic, the Loctite Super Glue Plastics Bonding System comes with an activator and does not require any mixing. Ideal for fixing car parts, jewelry, O-rings, rubber seals, figurines, toys and more, this plastic epoxy glue is known for its strength and high quality. Crafted with the ability to bond all kinds of plastic including Plexiglas, PVC, polycarbonate, and polystyrene, it also works great with wood, leather, cardboard, rubber, paper, cork, metal chipboard, ceramic, fabric and more. For best results, after applying the activator, always wait for 60 seconds before applying the glue. 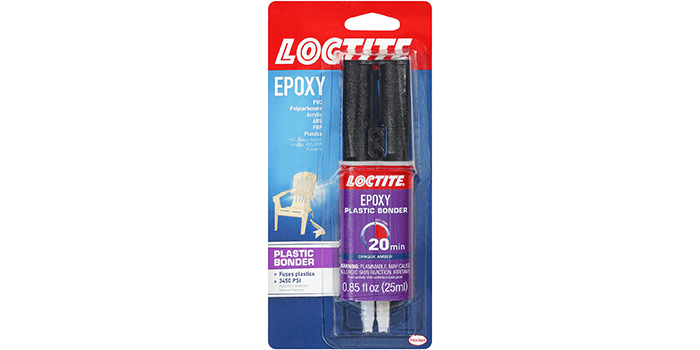 Crafted specially for bonding plastics, the Loctite Epoxy Plastic Bonder 0.85-Fluid Ounce Syringe works wonders on materials like nylon, PVC, ABC, acrylic, polycarbonate, stainless steel, Mylar and many more other plastic kinds. With a quick setting time of just 20 minutes, this heavy duty bonding agent fuses plastics together offering you with a 100% permanent repair of the object or surface. Resistant to various liquids including motor oil, solvents, diesel, and gasoline as well as high temperature, outer impacts, and moisture, this epoxy plastic bonder is among the best of its kind. 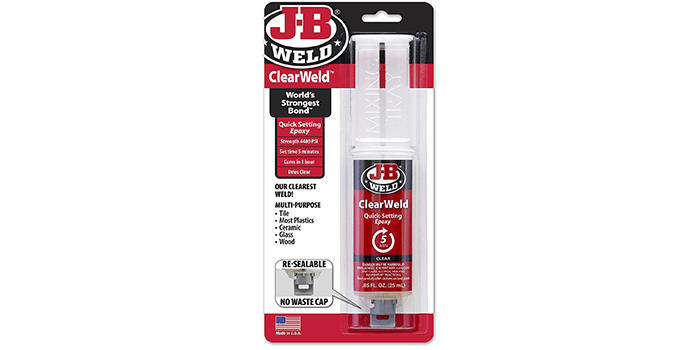 The J-B Weld 50112 ClearWeld Quick-Setting Epoxy Syringe includes a heavy-duty, crystal clear adhesive that takes 5 minutes to set and up to 1 hour to harden. Ideal for all kinds of plastic materials, this epoxy syringe also works wonders on metal, tiles, wood ceramic, glass and more. For a stronger, more permanent seal, it features a tensile strength of 4400 PSI. Made from premium quality elements, this quick setting epoxy syringe is designed with a no-waste screw on cap that ensures the glue doesn’t dry out or doesn’t mix. 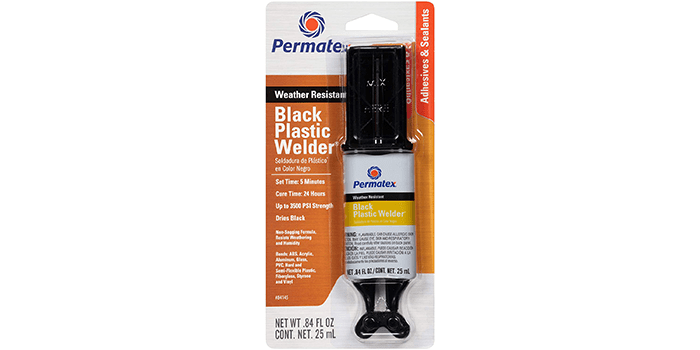 The Permatex 84145 Permapoxy Black Plastic Weld is a high-quality adhesive that is designed especially for sealing and repairing a wide range of surface types and materials. With the ability to form a durable bond along with a strength of 3500 PSI approximately, it can cure quickly within just 5 minutes at room temperature. Thanks to its unique formula and special agents, it can easily fill gaps for up to 0.125 inches. Resistant to weather, humidity and sagging, it bonds all kinds of plastic as well as ABS, Vinyl, Styrene, hard and semi-flexible plastic, aluminum, fiberglass, PVC, glass and more. The BSI BSI-202 Quick-Cure Epoxy features a 5 minute curing time and hardens to a rubber-like flexible consistency. Resistant to impacts and shocks, this heavy duty epoxy glue repairs and seals broken surfaces and leaks etc. by forming a durable bond that’s long-lasting. Unlike most of its kind, it penetrates deep into cracks and leakages, sealing it completely, especially in areas that face high levels of vibration and stress. After curing, objects can be handled in a minimum of 15 minutes, but for best results, it is always recommended to wait for up to an hour, which is when the full strength of the glue is reached. 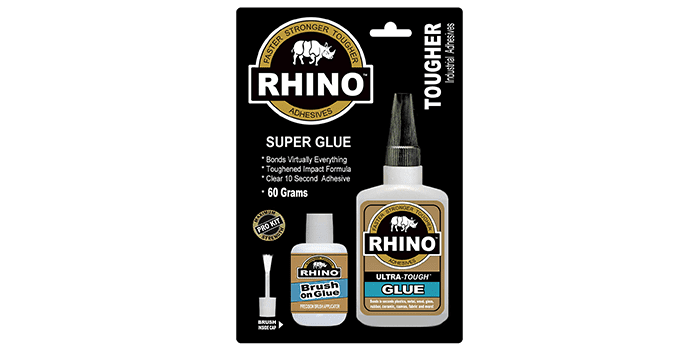 The Rhino Glue Pro Kit is a premium grade adhesive set that includes 60 grams of super-tough glue along with a handy brush cap. Unlike most of its kind, this adhesive comes with the ability to bond plastic, canvas, vinyl, glass, metal, wood, ceramics, rubber, acrylics and more in just a few seconds. Resistant to shock, vibrations, moisture, stress, impacts, and heat, this adhesive is triple distilled and offers a strong, long-lasting bond. 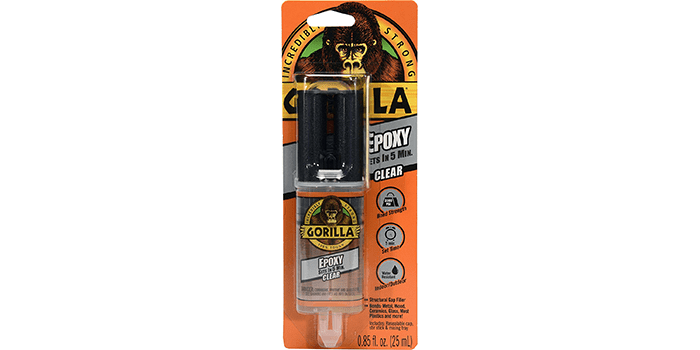 The Gorilla 2 Part Epoxy is a heavy-duty adhesive that is specially crafted to fix and repair a wide range of surface types. Including plastic, wood, metal, ceramic and more, this glue is strong, quick drying and permanent. With the special ability to dry clear, it makes it easy to clean and provides a clear, neat finish. Ideal for bonding, filling gaps and for tough repair jobs, it is resistant to solvents. Featuring an easy-to-use syringe, it ensures the resin and hardener are kept away from each other while evenly distributing both substances. Furthermore, thanks to the cap that comes with the syringe, it helps to prevent the glue from drying out over time.